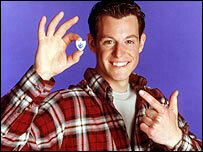 The BBC is tackling the sale of large volumes of Blue Peter badges on internet auction site eBay. The badges, awarded to young viewers who contribute to the programme, are touted as a way to gain free entry to museums and stately homes by vendors. A BBC spokesman said it was looking at ways to verify a badge belonged to its rightful owner. The badges, which carry the programme's famous ship motif, have been presented to celebrities, including Brad Pitt. The Queen and Madonna have also been presented with the honour. The BBC's spokesman added large numbers of badges had already been taken off eBay as a result of its intervention, adding it was "unlikely" this happened as a result of the corporation buying them. Its investigations unit has been monitoring the situation for the past few months. Blue Peter editor Richard Marson said: "We know how hard children work to earn a badge, and we are doing our best to ensure that this long-standing Blue Peter institution is not undermined." On Monday morning there were 18 Blue Peter badge auctions taking place on eBay, with prices ranging from 99p to £49.50. The auction site was not immediately available for comment. Edinburgh Zoo has said it is stopping free entry for children in the wake of the badges being sold on the internet. A spokeswoman said they became suspicious of an increase in badge-holding visitors, including one family where every child had one. The badge comes in five types. A gold Blue Peter badge is reserved for exceptional achievements such as saving a life, while a green one is awarded for conservation work.